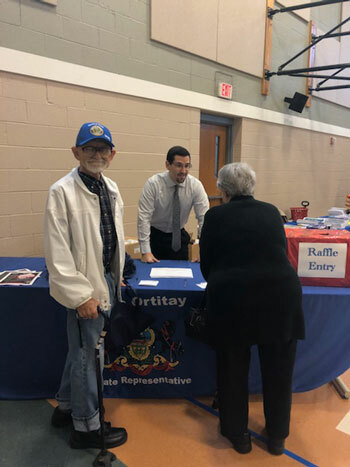 On Tuesday, I hosted my fourth annual Senior Expo at Bethany Presbyterian Church in Bridgeville. Thank you to those who attended. We had a great crowd! I hope everyone enjoyed themselves and came away with useful information. Members of the House Professional Licensure Committee this week examined legislation that would allow health care to be more accessible and affordable by offering telemedicine options for patients. Telemedicine refers to the remote delivery of health care services and medical information using telecommunications technology, a significant and rapidly growing component of health care. Through the use of telemedicine, specialists and other health care providers are able to expand their reach, helping patients stay in their communities and avoid traveling long distances for specialized care. Legislation has been introduced in both chambers (House Bill 1648 and Senate Bill 780) that would define the term in state law and offer clarity for insurance company reimbursement for these services. Although the legislation requires payments for telemedicine services, those payments would be established between the provider and insurer. Among those testifying at this week’s hearing were physicians, nurses, medical information technologists, insurance industry representatives and a rural school superintendent. The new School Safety and Security Grant Program – established as part of the 2018-19 state budget package – is now open for applications. Schools interested in applying for grants to help with safety equipment and resources should submit their applications by Oct. 12 to the Pennsylvania Commission on Crime and Delinquency, which is administering the new program. A total of $52 million in grant funding will be provided to school districts, intermediate units, area vocational-technical schools, charter schools and private residential rehabilitative institutions for a wide variety of projects to improve school safety. The grants can be used for any of 22 specific school safety initiatives listed in the legislation, including such things as hiring school security officers, purchasing security-related technology, completing safety and security assessments, implementing violence prevention curricula, offering counseling services for students, and other programs and services to protect students. The grant money is to be distributed geographically, with no school district receiving more than 10 percent (but eligible for at least $25,000) of the available funds. The money is expected to be distributed by March 2019. To apply or for more information, visit the Pennsylvania Commission on Crime and Delinquency’s website here. Local workforce development boards can apply for $2.5 million in Business-Education Partnership (BEP) grants that will connect businesses and school districts – all in an effort to expand new career opportunities across Pennsylvania. The funding is available through the Department of Labor and Industry to local workforce development boards, which are regional entities that direct federal, state and local funding to workforce development programs in their areas. These partnerships connect schools, employers, parents and students to provide career-related experiences and opportunities through soft-skills development, internships, workplace shadowing and career mentoring, all with the goal of engaging more students in the need for technical skills required by employers. Last year, nearly 9,000 students throughout the state participated in partnership activities. Additional details and the grant application can be found here. The deadline to apply is Oct. 31. The Pennsylvania Game Commission again has installed a camera on State Game Lands 311 in Elk County, in a field that typically is a hub of elk activity as the bugling season this fall heats up. Video and sound from the camera are being live-streamed at pgc.pa.gov, and viewers can expect not only to see elk, but turkeys, deer and other wildlife as well. The page also contains information on Pennsylvania’s elk, where to view them and links to the Pennsylvania Great Outdoors website, which includes all sorts of helpful information for anyone visiting elk country. The live stream is slated to run until the end of the bugling season, likely sometime in mid-October. The top time to see elk on camera is late in the afternoon.